I'm probably the first person to try Peter Wimmer's MVC to AVI utility. It's my editing dream come true. There's a problem, though. Using the Cineform HD-2 compressor, the conversion is lightning fast, but the field order of the left/right files are both reversed. That creates jittery motion. Here are an original JVC mp4 stereo file and the left eye view as extracted by Peter's utility (form my Dropbox account). Forgot to ask my questions. Any idea why the field reversal is happening? Apparently, it's not happening when users use compressors different than Cineform HD-2. Second question - when might Cineform support the conversion directly? Soon? Weeks? Months? The field order is not wrong, the decoder simple not reporting it to media player, it doesn't cause any other issues, all your exports will be fine. The was a reason for this media player glitch, but it escapes me at the moment. We support both Video for Windows and DIrectShow based compression, so that explains two entries. DirectShow is newer, use that. Encode vs Encoder-2 DShow filters are similar although 2 is threaded and therefore faster on multicore systems. Hmmm. I'm not sure I understand what's going on or what to do about it. Windows 7 Media Player plays the fields reversed. Adobe Premiere CS5 plays the fields reversed and doesn't export normally unless I reverse the field order in their software. Also, Premiere seems to discard every other field when I do a progressive export. I get half res output - and seriously compromised image quality. Does Neo support the interlaced format of the new JVC and Sony camcorders? I'm struggling to figure out what's going on, and I don't know how to fix it. I can confirm the speed of the conversion with HD-2. On my Core i5, I get faster than real time extraction and encoding of the two streams. I expect that to improve if I move all this to my main editing computer, which is a Core i7 with hyperthreading. The conversion also look fantastic. I'm just concerned about the reversed field order and how to fix it, and the apparent discarding of a full field when I export from Premiere. I have download your clip, you have made an error. When you set up the encoder (Encoder-2) you get select progressive or not (interlaced) under "Configure...". You have selected progressive, messing you up from that point on. Leave "Single Frame Picture Group" checked, but "Progressive Frame Encoding" unchecked for interlaced sources. In any case we don't de-interlace for MediaPlayer, so you are going to see fields in that tool (yes they are unpleasant) but NLEs will now behave correctly. The results appear to be the same - that is, the files play with reversed fields. I'll try a Premiere export to see if that has changed. Thanks, Dave. I appreciate your time. I'll go through tech support for follow-up questions. When I import files into Vegas Pro 10d from Encoder-2, audio is not synched with video, because video track is 10% shorter! Can I do the MVC to AVI conversion in this utility on a PC and then take the resulting files to use them in Neo3D and Final Cut Pro on the Mac? Yes you can convert to on PC, and mux the left and right to an MOV for the best support on a Mac. Hello, I have been converting footage from the new Sony TD10 on a PC and then Muxing on a Mac. The only thing is that I find myself having to remaster the avi files TWICE on the Mac. This is the only method that I have found were I can mux the two eyes and then Edit them in Final Cut 7. Do you have any idea why or any suggestion to make the process faster? I upgraded to Neo and started using MVCtoAVI. Below is a ROUGH edit of footage shot with the JVC TD1. I used MVCtoAVI to split the filss, then muxed them in FirstLight. I edited those 3D files in Sony Vegas 10d and output to a 3D Blu-ray iso file. I've tested it in both Sony and Panasonic 3D Blu-ray players, and on a JVC RS40 projector, Samsung C8000 3D plasma and Samsung 3D LCD. There are two clips in this iso that will never be in the final edit. One is of a girl walking right to left with a baby stroller. She exhibits the same stuttering appearance I see in the file splits but not in the original JVC mp4 file. This file exhibits the problem throughout my production process. I still need to talk to Cineform tech support about it. The other bad clip is a Blackbird (Steadicam). It's there only to show the potential of the device (once the user gets the hang of it :D). I'm sharing 3D editing ideas with others over at AVSForum. I'm very happy with MVCtoAVI. If only I can get the "stuttering" issue resolved, it will be a perfect solution for me - along with Neo. Hello, I'm new with that. Is the CineForm HD Encoder-2 integrated in the Neoscene product ? Or should I get the upper line (Neo or Neo 3D) ? You'll need Neo or Neo3D. I've got the JVC TD1, and FCP 7. I want to shoot in full HD. To use the converted do I need a PC? Or how can I split the L and R? Any help is appreciated, sorry if there totally newbie questions. The MVCtoAVI app lights up the processors - usually over 90%. FAST. Out of curiosity, is the core of MVCtoAVI FFMPEG? Trial version of the MVCtoAVI app has a watermark for the eval, but it's small, unobtrusive, and doesn't deter from judging the quality. MVCtoAVI is based on CoreAVC we believe. We are consider that along with other native MVC decoders coming to market. It shouldn't be too long before conversion is a one step process to a stereo CineForm file. Have there been any advances in this regard? This is the only thing that I'm waiting for before purchasing! 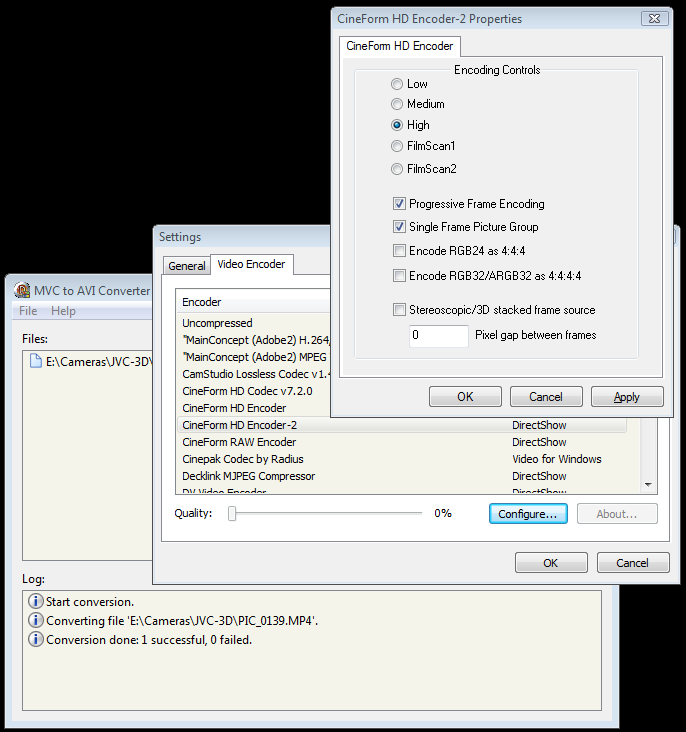 Hi, can I deinterlacing Cineform's AVI files from JVC TD-1 in HDLink (if I use MVC2AI workflow) ? I have the Sony TD10 and edit with Final Cut Pro. The following link discusses my workflow (as well as my trials and tribulations). I used MVC to AVI on Windows running on Bootcamp, but converted them to uncompressed AVI's. I'm gonna try to go to Cineform and see if that is better. Then I take the uncompressed to the Mac side and convert them to ProRes files with Compressor. Then use Dashwood's plugin in FCP to edit. The process is agonizing and slow. I can't wait till I can go from MVC to .mov in one step. I'm hoping Cineform will do this. Any progress on this conversion front? Just checking. If it doesn't look like it's going to happen in the next few months, I will hold off, as I want to buy the JVC camera, but know I would want to kill myself with all the additional transcoding. Thanks so much for your valuable time. I'm experimenting with the Sony TD-10 camera for an underwater show where a very small form factor is of the essence. I had high hopes for this camera, but, after using the MVC to AVI utility, I'm getting a lot of jittery motion on the resulting Cineform files. What gives? - What settings should I use on the Cienform encoder? This camera records to 60i in 3D, does that mean, 60i for each frame, or 30i per frame? - Dies this mean there's no way to obtain a progressive frame out the camera, or de-interlacing is the only option? I would like to work on a 24P or at least 30p timeline, so what's the best way to get there with the limited settings on the Cineform encoder available through MVC 2 AVI? How can I eliminate this jittery motions I get from pans and tilts? If this is unavoidable, then this camera is out of the question for me. The TD-10 has no 3D progressive modes unfortunately. And I'm not a big fan of interlaced (particularly for 3D.) The Sony HXR-NX3D1U in the pro version in the same body does has progressive 3D at 24p. For the TD-10, you need to set the encoding to interlaced. I'll look into the NX3D1 option, pity its more than twice the cost for basically just the added functionality of 24p and some audio functions I will not use. Anyway, it will have to do. As a side note, I see on the B&H specs sheet that Cineform should have its own MVC conversion utility soon. Is this the case, and if so, when-abouts? Very soon. We have the MVC tools ready under Windows, just awaiting to close a few business loose ends. Got the NX3D1, and while I build underwater housings for it, I was wondering about the convergence setting of the camera. I know the interocular is fixed at 31mm, which is very good for close shots, ironically the weak spot of side by side rigs, but not so good for anything over 20 ft away from the camera. Do you know if using this convergence adjustment in any way degrades the image quality of the images? I read that what's shifted are the pixels used for the 3D effect within the image, but this does not tell me much. I would love to be able to widen my convergence a bit but not at the cost of distortion or image quality loss. Any thoughts on this? i have a problem... when i try to use cineform hd encoder it fails to load. i can choose from a long range of codecs, canopus, uncompressed, dv but none cineform codec. how can i solve this, please. You no longer need to use MVCtoAVI as MVC support is now included in our newly released CineForm Studio Premium. But question is one for support@cineform.com, likely you haven't got something installed or activated correctly. Does Cineform Studio Pro support JVC TD1 mp4 files in 3D mode? On my system, it sees the files as 2D only. Sony and Panasonic MVC is supported by CineForm Studio Premium, unfortunately JVC used an different wrapping format we aren't yet supporting. Thanks, David. I was hoping that had changed since I last checked in. I can still use MVCtoAVI to split the files, of course, but the process is tedious. I haven't upgraded from Neo yet. does Cineform sutdio professional alos support Sony MVC files? Or only Premium? so it means I need to convert MVC footage with HDlink and then I can edit in premiere right? Not in HDLink, MVC is supported in the new CineForm Studio interface which does the transcode. you should try Fujifilm camera just one time, Fujifilm cameras have best 3D camera. I hope you will be satisfied with fujifilm. experience the photo and videos in real 3D with Fujifilm 3D image products, Finepix 3D Digital Camera and 3D Image Viewer.